Drive tray from early Mac Pro. Image courtesy of Coyote Moon, Inc. If you have one of these early Mac Pro models or are thinking of picking one up on the used market, this guide will provide all the information you need to upgrade the Mac Pro's storage system. Mac Pros from 2006 through 2012 shipped with four 3.5-inch internal hard drive bays. Each drive connects to a SATA II (3 Gbits/sec) controller. In addition, the Mac Pros also have at least one optical drive, plus space for a second optical drive. The 2006 through 2008 Mac Pro optical drives use an ATA-100 interface, while the 2009 through 2012 Mac Pro optical drives use the same SATA II interface as the hard drives. The most popular method of expanding the Mac Pro's internal storage is to add hard drives using the built-in drive sleds supplied by Apple. This method of upgrading is a snap. Pull out the drive sled, mount the new drive to the sled, and then pop the sled back into the drive bay. You can find a detailed step-by-step guide for installing an internal hard drive in a Mac Pro. Please refer to that guide for installation details; it will be part of the process for many of the storage upgrades we're going to mention in this guide. An SSD (Solid State Drive) will work in any of the Mac Pro models. The important thing to remember is that the hard drive sled Apple provides is designed for a 3.5-inch drive, the standard size for desktop hard drives. SSDs come in a variety of styles and sizes, but if you're planning to install one or more SSDs in a 2006 through 2012 Mac Pro, you must use an SSD with a 2.5-inch form factor. This is the same size drive used in most laptops. In addition to the smaller drive size, you'll need either an adapter or a replacement drive sled designed for installing a 2.5-inch drive in a 3.5-inch drive bay. If you're using an adapter, the device must be able to mount to your existing Mac Pro drive sled using the bottom mount points. Some adapters only work with the side mount systems common in PC cases. Here are a few adapters that should work with Mac Pro drive sleds. The other option is to replace the existing Mac Pro drive sled with a sled designed for both the 2.5-inch drive form factor and your Mac Pro. Apple used two different drive sled designs. The OWC Mount Pro will work in 2009, 2010, and 2012 Mac Pros. Earlier models require a different solution, such as the adapters mentioned above. The other point of concern is that Mac Pro drive bays use a SATA II interface that runs at 3 Gbits/second. That places the maximum data transfer rate around 300 MB/s. When purchasing an SSD, be sure to check the SATA interface it uses. An SSD that uses SATA III, which has a maximum transfer rate of 600 MB/s, will work in the Mac Pro, but it will run at the slower speed of a SATA II device. Although you won't currently get the full bang for your buck, purchasing a SATA III SSD (also called a 6G SSD) may still be a good choice if you plan to move the SSD to a device that supports the higher speed in the near future. Otherwise, a 3G SSD will work quite well in your Mac Pro, at a slightly lower cost. If getting the last ounce of performance out of an SSD upgrade is important, you can do it using one of two approaches. The first, and by far the easiest, is to use a PCIe expansion card that has one or more SSDs mounted on it. By connecting directly to your Mac's PCIe 2.0 interface, you can bypass the slower SATA II interface used by the drive bays. PCIe-based SSD cards are available in multiple configurations; the two most common types use built-in SSD modules or allow you to install one or more standard 2.5-inch SSDs onto the expansion card. In either case, you end up with a fast 6G interface to the SSDs. If you need more drive space than the four drive bays provide, and adding either a PCIe card or an SSD card still doesn't give you enough space, there are other options for internal storage. 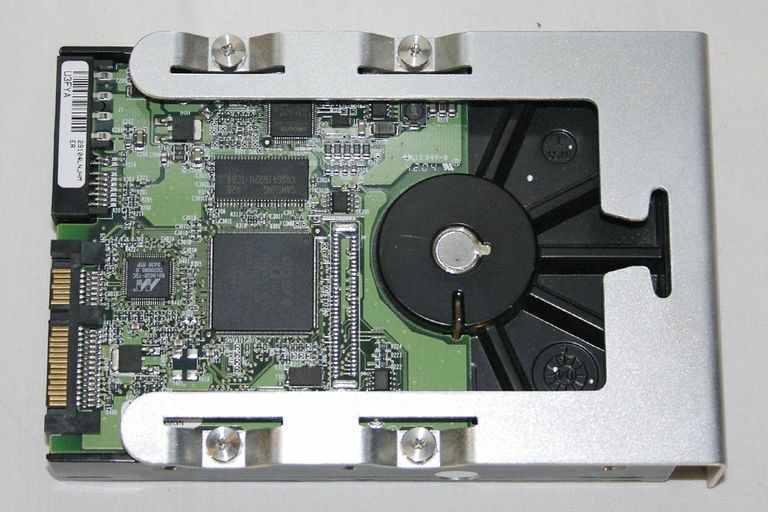 The Mac Pro has an additional drive bay that can hold two 5.25-inch optical drives. Most Mac Pros shipped with a single optical drive, leaving an entire 5.25-inch bay available for use. Even better, if you have a 2009, 2010, or 2012 Mac Pro, it already has power and a SATA II connection available for you to use. In fact, if you don't mind performing a bit of DIY, you can simply mount a 2.5-inch SSD to the drive bay with a few nylon zip ties. If you want a neater setup, or you wish to install a standard 3.5-inch hard drive, you can use 5.25 to 3.5-inch or 5.25 to 2.5-inch adapters. That covers our basic guide to internal Mac Pro storage upgrades.